What is a “smart meter”? What is HEMS (Home Energy Management System)? HEMS is a system for cleverly managing the various types of energy used in the home. Installing HEMS makes data on electric power generation and utility usage as well as gas and water used amounts “visible” on monitors and other screens, facilitating “control” of HEMS-compatible home appliances and household devices. By making the electricity used by home appliances more “visible”, each member of your family will become more aware of saving energy, wasteful use of electricity will be eliminated and energy costs will thus be reduced. And when you go out, you will be able to “control” energy use by switching off all HEMS-compatible appliances with a single action, thus avoiding energy wastage such as forgetting to turn off devices. Shared communication protocols are necessary to achieve two-way communication between HEMS controllers and various home appliances, household devices, etc. 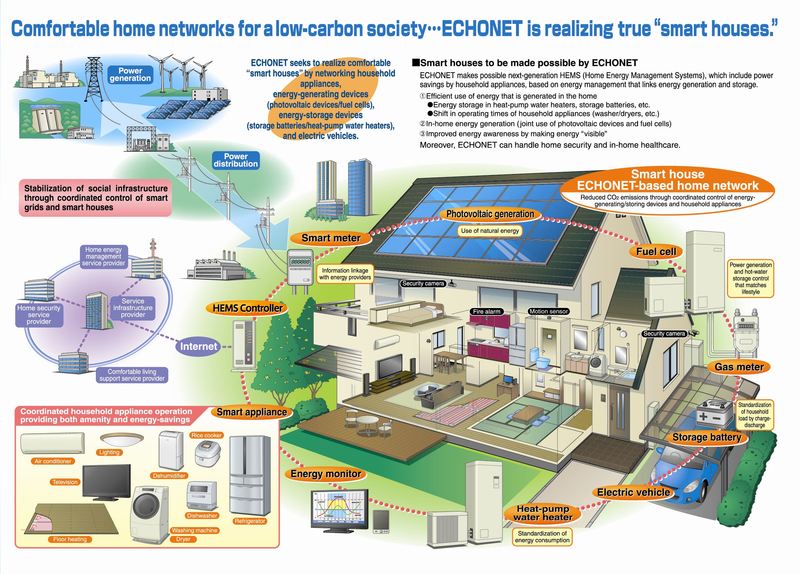 This function is provided by the ECHONET Lite Specification. With HEMS controllers adopting ECHONET Lite and devices compatible with HEMS, it should become possible for different manufacturers’ products to be connected together for use.